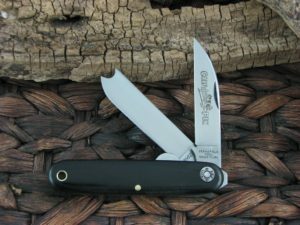 This is the Great Eastern Cutlery Farm & Field Bullnose Sodbuster, has OD Linen Micarta handles and Steel liners. The blade steel is 1095 and finish is Satin. *Our opinion: The pull is a 8. The GEC effort on this run as compared to their entire catalog is 8. As a worker the ergos are great but event with M-L size hands I feel most average handles crowd my fingers. I wish for a SFO with a larger blade and handle nearing the RAT 1. 5 out of 5	Tough little knife! 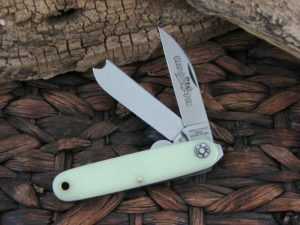 Perfect little working knife that disappears in you pocket yet is stout enough to tackle basic everyday cutting tasks. Fit and finish is spot on! Another great purchase from CK! 5 out of 5	Fantastic Blade! The knife that I received is perfect, other than the blade needing some love! Fit and finish is near perfect! Keep up the good work GEC! Yes the pull is an 8…..just the way I like it on a sodbuster pattern that’s meant to do heavy duty cutting chores. Strong springs mean it’s less likley to close on your fingers while piercing something with the knife. It’s still easily pinchable and if the pull were any less, I’d be disappointed. Flush at the half stop and at fully open positions. Nicely centered blades and over all excellent fit and finish. Exactly as I’ve come to expect from GEC. If I could give it 10 stars I would. Nothing fancy just a good solid work knife. Pull is a little on the heavy side so I forced a patina and now I can pinch the blade open. Very nice knife for the price! This is a sweet Knife I don’t have anything negative to say about this knife so far. I love the tight pull. Factory edge was perfect. The fit and finish was even better than I expected. This was my first Bullnose and I’m very proud of it. The shipping package and time were awesome. Great knife overall. Beautiful micarta and great build quality. Have not noticed the rapping, but I have babied it closed so far. Agree with the other reviews that the the pull is definitely intense… more like 800 :-)… but I am sure it will ease over time with some oil and repetition. Pull is only reason I docked this a star because otherwise it is a great knife at an amazing price. 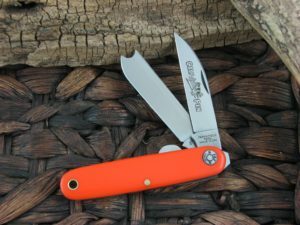 Solid well made knife with the usual high quality GEC fit and finish. 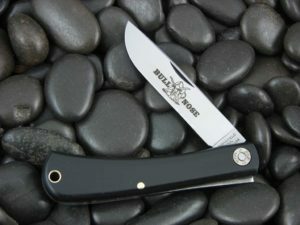 I purchase the Bullnose to be a working knife that could take some punishment. I am confident that the #71 will hold up to all tasks. Very secure solid feel in the hand. Its going to be a great knife. However the pull as mentioned is nothing less than intense. As others have mentioned I hope it becomes a bit easier with use. All things considered at this price point it was a good purchase. One star off for the pull. definitely an 8 or better. That’s why it only gets 4 stars (I was thinking about giving it a 3 star review but it’s too pretty.) This is my 3rd GEC knife and by far the most difficult to open. I’ve been working on it by oiling it and leaving it open in-between the half stop and full open which I think has helped a bit. I’m sure it will get easier with time and use. Agree this is a 8 pull which is my only complaint. I like a lighter pull since I don’t keep nails so this is right at the limit of too strong in my opinion. A 6 would be just fine. The fit and finish is excellent as per GEC. A lighter pull and this would be 5 Star all day long. A very well made knife with a strong pull and snap. You won’t be disappointed! Above the model #, gec car is stamped. “Car” stand for carbon?